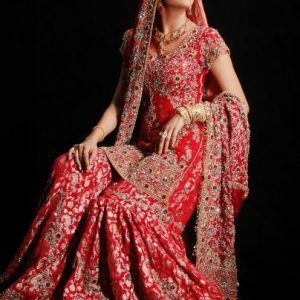 Tags: Bridal, Deep Orange, Deep Red, Front Open, Gown, Mehndi Mayon Henna. Double tone pure chiffon front open long shirt features stunning embellishment all over the front and small motif spray at the back. Deep red pure chiffon lehenga with embellished border all around the bottom.